JakDaw Presents is delighted to BARE All for all you lovely people and declare that SUMMER HAS OFFICIALLY ARRIVED! With BARE In The Woods 2017 returning for its biggest year yet hosting a three-day festival this June at Garryhinch Woods, Portarlington; we here at JakDaw Presents want to get you in the mood for the festival season with our JakDaw BARE’s All showcase event. Mongrel State emerge from the wilderness to rock the socks off Generator Hostel Dublin. The four piece return to BARE In The Woods 2017 to thread the boards and rock the house once more. Their honkytonk pianos, fourpart harmonies, New Orleans grooves, electric guitars, and inventive songwriting will get your heart racing and your feet stomping. This is why we are proud to present Mongrel State as a great example to showcase the diversity of this irish festival. Young Earth’s indie-pop/rock feel you will be dancing the night away as they drift effortlessly between bouncy summer pop and heavier, overdrive drenched styles. This Indie Rock band’s obsessive focus on solid hooks and singalong choruses are guarenteed to put you in the mood to pack up your tent, take the wellies out of the shed and prepare yourself for what is sure to be the festival of the year at BARE In The Woods 2017. So root out your favorite festival shirt, put on that bejewled headpiece (no it is not too much for a Friday!) and come on down to The Generator Hostel on Friday, 19 May and kickstart your summer in style! With great tunes, awesome atmosphere, and even better drinks promotions this is a night not to be missed! We all love outdoor events, specially when the summer is coming! 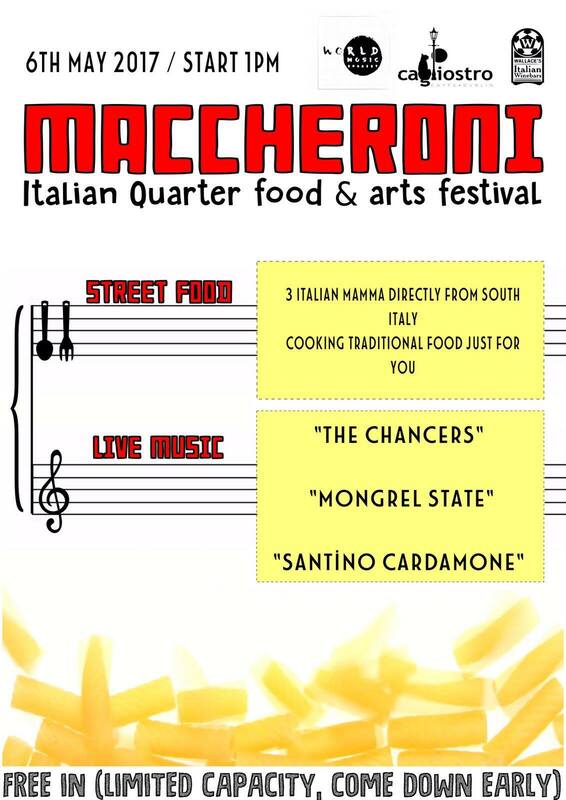 and if you add Italian Street Food and live music… just makes the perfect plan! We’ll have two big gazebos covering most part of the Italian Quarter, no even the rain can stop the party! Speak about Italy is speak about food & wine, we are bringing to Dublin three Italian Mamma’s, they will make fresh pasta and cook tradicional Italian Food. We’ll have deep fried panzerotti pugliesi ,pizza fritta napoletana ,panini alla griglia and you can always get food from Wallace Taverna, Enoteca delle Langhe and Caffe’ Cagliostro. Craft Italian Beer, organic wine and Aperol Spritz will be served too. After the headline act from Santino Cardamone, CALAMBRE will close the night with his energetic mix off TROPICAL BASS: tunes from Italy, Spain, Balkans, South America & Africa. 1. Access to the Italian Quarter will only be through the Quays end. 3. This is a free entry event but people is not allow to bring their own drinks. 4. Please follow instructions of security at all times. 5. Please, use bins provided and respect Italian Quarter Neighbors.